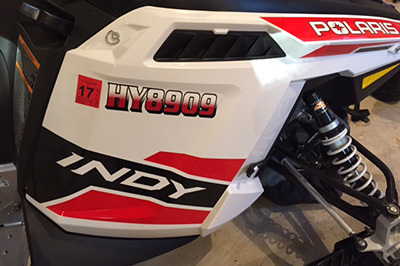 We use high performance vinyl for all our custom snowmobile registration numbers. Snowmobile letters are available in a wide variety of colors. Snowmobile lettering is typically 1 7/8" in height. This is the dimension we shall use unless instructed otherwise. You can get creative with designing your own or let me design for you, just email me your number and what kind of sled you have, along with the color and I can take it from there!